Herbs & Quinoa Salad — Cohabitate Co.
As the the holiday season bustles on, we wanted to stop and devote a moment to one of nature's amazing gifts: quinoa. These tiny 2mm seeds have been nourishing people for over 3000 years! Quinoa is a bona fide super food; a complete protein packed with calcium, magnesium, iron, phosphorus and fiber. It is low in calories, easy to digest, and gluten free. The United Nations declared 2013 the "International Year of Quinoa", so we though it imperative to share this news before the years end. After more research, my amazement of this minuscule, nutty tasting grain continues. In spite of it's recent popularity and copious value, less than 20,000 pounds of this astonishing grain was produced in the United States for market sale in 2013. Little did we know at the time of photographing Wild Rose Farm in Blue Lake, California, that this was going to be the only farm in the U.S. this year to produce and market quinoa! Wild Rose Farm has been growing quinoa on some level for over a decade, and coincidently, White Mountain Farm in Mosca, Colorado cultivates about 100 acres of quinoa annually, making them the largest producer of quinoa in the United States. Due to the ingenious labors of my dear friends at Wild Rose Farm, quinoa has been a featured staple in my bowl. This summer I got hooked on mixing herbs with quinoa, partially because my summer herb garden was irresistible. I was adding herbs to everything I could! My summer indulgent outlasted my herbs and has continued through the fall. Now, the only difference is that I get to purchase the herbs from the grocery store. I invite all of you to tantalize your taste buds with this quick, healthy, flavor filled super food and enjoy! After water boils, add quinoa, lower heat to medium or medium low, place a lid on top and allow to cook until all the water is evaporated and grain is tender and soft. While quinoa cooks, place herbs into mini food processor along with olive oil and lemon juice, and chop/blend them all together. 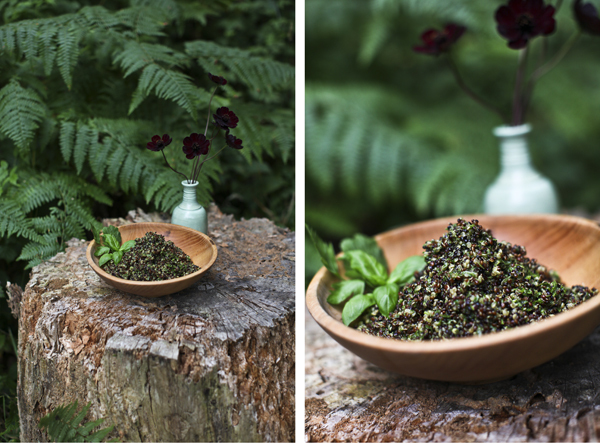 Once quinoa has absorbed all the water, stir in herb mixture until well combined and enjoy! * Above quinoa photos are from Wild Rose Farm, Blue Lake, California.